Despite the growing research on usability in the pre-development phase, we know little about post-deployment usability activities. To characterize these activities, we surveyed 333 full-time usability professionals and consultants working in large and small corporations from a wide range of industries. 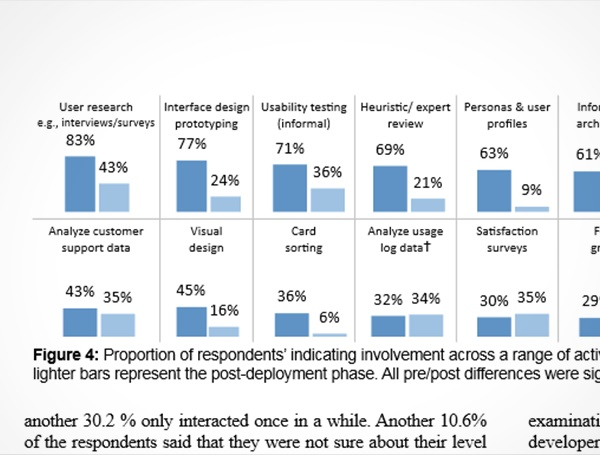 Our results show that, as a whole, usability professionals are currently not playing a substantial role in the post-deployment phase compared to other phases of user-centered design, but when they do, practitioners find their interactions quite valuable. We highlight opportunities in HCI research and practice to bridge this gap by working more closely with software support and maintenance teams. We also raise the need to understand what might be called 'usability maintenance,' that is, the process and procedures, by which usability is maintained after deployment.